We provide a download of our whois database as a MYSQL dump file. The records are not older than 4 months, most of them up to data at the time of download. The data is parsed and raw. The Whois database download contains complete whois of the following TLD's: .com, .net, .org, .us, .biz, .mobi, .info, .tel, .name, .pro and total approximately 135 million records. Possible applications and usages of the whois database download are cybersecurity analysis, fraud detection, and statistical research analysis. If you intend to use the data for spamming or other illegal activities, we will decline the sale to you. After payment we will reach out for you and discuss the transfer of files, please be aware that: You need to make sure that you have a server infrastructure as well as technical understanding to unpack and run a database of this size. Please note that we will not refund the purchase if you claim not to be able to set the Whois database download up. We will provide assistance, but we will not do the work that has to be done on your server. Some decades following the advent of the Advanced Research Projects Agency Network (ARPANET), or what we now call the internet, the Whois Database was formed. It functioned as a way to record information of those sending and receiving messages through the network. With the continued growth of online communication, an organization known as the Internet Corporation for Assigned Names and Numbers (ICANN) established a security protocol that requires domain registrants to share contact details. Whois, which contains these details, has grown to become a database that houses information ranging from registrants’ names and addresses to the complete log of a website’s lifelong activity. Stemming from providing a way for scientists to share data and later serving as a military network, the internet is now in the hands of everyone around the world. Each year, millions across the globe acquire a new domain, which adds up to more than 300 million registered domains. That’s a wealth of information being collected in the repository. So, whether you are a site visitor seeking a way to track down a site’s owner or a security researcher cracking down on cyberattacks, a Whois download can be of service. As long as a domain is registered publicly, it can be found easily. Though the majority of users are not aware of the database, it continues to grow and provide basic to critical information for searchers in various fields. If times call for the use of Whois, the plethora of facts gathered in this repository may seem overwhelming to some. For your benefit, domainindex.com provides that information to you when you download it from our site. Furthermore, the data you acquire from the Whois database download will be presented in both parsed and raw forms. More details are provided below. What’s In a Whois Database Download? The fact that with just a simple search you can find a domain registrant’s basic information, such as phone and address, just scratches the surface. Whois searchers have various reasons for seeking information about a domain or its owner. Listed below are some of the data available via a Whois lookup. Who Can a Whois Database Download Help? The Whois repository has many uses, and researchers have a wide array of reasons for finding the above listed information. You may be a website visitor who needs to contact the owner for an inquiry or perhaps a technical difficulty. Maybe you need to look a little further into trademark or intellectual property misuse. The resource may be particularly handy for registrars, security researchers, and fraud detectors. As a domain registrar, Whois can assist you with filtering out the bad apples who purchase your domains. It makes it easier to connect possible malicious activity. For example, the database helps you find other domains registered to someone who is a suspect. Additionally, it can supply pertinent contact information to determine if a domain is actually owned by a professed owner. Whois also makes it possible to contact and follow up with registrants who have been victims of cyberattacks and fraud. With the millions of malware threats that emerge each day, you have one of the most essential jobs for the world wide web. It’s one thing to perform the complex tasks of analyzing, collecting and presenting security threats. It’s also necessary to track a cyber attacker’s trails. Whois serves as an imperative tool for finding an attacker and mapping an attack’s infrastructure. Most often than not, attackers are owners of more than one domain, and many of those may also be the culprit. Whois makes it possible for you to track down all of a suspect’s registered domains. This also includes the activity and IP changes associated with those domains. In the end, it’s a trusty sidekick for both finding culprits and inhibiting further attacks. Internet fraud shows itself in many forms, such as a data breach, e-mail account compromise, and denial of service. One possible scenario could be a suspicious e-mail from a company’s CEO containing a request for personal or confidential data . Furthermore, more cases arrive every day in which someone sends cyber threats posing as another. Whois assists fraud detectors with finding the true registrant and helps them determine if the registration history actually complies with that of the company or individual. Whois may assist statisticians with gathering domain activity and usage data to assess trends. For example, a market statistical researcher may analyze domain usage for a given niche. Also, it’s easy to use Whois to compile data for most popular domain categories. 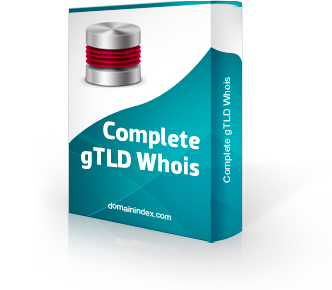 What Are The Benefits Of A DomainIndex.com gTLD Whois Database Download? Download both parsed and raw results. Download as a MySQL dump file. Search over 135 million records. Search among all Generic Top Level Domains (gTLDs): .com, .org, .us, .net, .mobi, .info,.pro,.biz,.name,.tel. Up-to-date records that are no older than 4 months old. Note: After your payment has been processed, we will assist you with file transfers. However, we can not help with issues pertaining to your server. Be sure to have the infrastructure and technical understanding needed for unpacking and running a large sized database such as this one. Why use MySQL dump instead of CSV files? CSV, short for Comma Separated Value, files are just that: raw data that has been separated with commas. MySQL, which stands for My Structured Query Language, is quite popular since it allows parsing into tables. You can use advanced search queries to search the tables. Both CSV and MySQL files present information that is more user friendly than raw data. MySQL dump makes it easy to transfer the entire Whois database. In addition, MySQL dump files can not only be converted into SQL files, but also CSV files. This is why customers are more likely to request MySQL dump files. Why Does The Download Include Just GTLDs? Over the years, the generic top level domains have become quite popular. The majority of the Whois searches are for these types of domains. One reason gTLD searches are popular is their susceptibility to cyber fraud and attacks. Registrants with malicious intentions have flooded the generic top level domain arena. They have been known to buy multiple domains that they can use for their diabolical purposes. What is the difference between parsed and raw files? Data in the raw format is presented continuously and inconsistently. It may even be incomplete. On the other hand, parsed data is easier on the eyes and has some form of organization. The domainindex.com Whois database download provides both raw and parsed data. Is there a fee to view Whois information? Once your download has been completed, there is no fee to access the database. It’s a public database, so the available data is free to everyone who conducts a search. How can I access private Whois data or domains that are protected with Whois guard? Any of the public information within Whois can be accessed. However, some registrants choose to remain private. For these domains, you may only see the registrar’s name, the registration date, expiration date, servers used and any domain updates. Unless you are a member of law enforcement or some other authoritative organization that may access private data, there is no legal method to do so. In retrospect, it's clear that the Whois Database is a convenient tool to have no matter what your reasons are for downloading it. It has become a necessary agent in both attaining basic information and helping professionals carry out job duties. Contact us today for more information. Total size of mysql dumps is between 1GB and 80GB. After payement we will reach out for you and discuss the transfer of files.